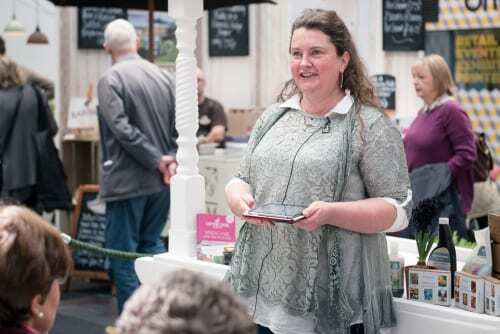 Sara has just returned from a wonderful week contributing to the programme of talks at the Country Living Spring Fair, it was lovely to meet so many people who had been to our talks in previous years or read about us in the magazine features. The biggest highlight of the show was our final presentation on Sunday afternoon, Turning a Hobby into a Business. On one hand I was very excited to have been asked to give this talk, as last year I remember watching Sophie Allport, who designed several items that we have at home, bring this session. On the other hand, it was the last presentation of the show and I expected a very small, if any, audience. I decided that the best visual aid that I could bring to the session was my husband, Andy, and we planned to lead the session together sharing the story of Hen Corner over the recent years. If there was no-one in the audience, at least I’d still have someone to talk to on the sofa! Fortunately, I had underestimated the appeal of the session and we had a full house, both sitting and standing at the back, and were privileged, after the talk, to be able to meet and encourage several other individuals who are aspiring to start their own small businesses in the coming months. Now that Spring has officially arrived, and the days are longer than the nights, we are more than ready for the long Easter weekend and the celebrations that it holds. We have a few places left for Easter at Hen Corner where we will be cuddling chickens, hunting for eggs (real & chocolate), and get crafty in the conservatory before hot cross buns for tea. We have also planned our Easter Microbakery to be a day early, on Thursday, allowing our customers to collect their bread and treats in time for the long weekend. Looking ahead, after Easter, we have a couple of new exciting courses that are open for bookings. By popular request we are delighted to offer you Cheese in a Day on Wednesday 27th April and Simply Sausages on Thursday 12th May. As usual, everyone goes home with a goodie bag including recipe sheets and your homemade products. With the longer days, we now have regular courses, events, schools and corporate bookings here at Hen Corner. The next month or so sees Bread: Sweet & Savoury, Easter at Hen Corner and more Family Feathers and Fun! so if you’ve been thinking about trying something new, do get in quick! Mow that lawn before it gets too overgrown!